That was an amazing weekend. 4 days off of school, lots of cycling related activities, my first foray into bicycle touring, and a new steed to my stable. Plus my daughter is getting so close to riding on her own. Stoked. I took her out on Friday morning to try to ride. I brought her and her wheels down to the neighbourhood park. My plan was to get her to coast down a bit of a grassy incline, hopefully gathering enough monentum that she could get her feet on the pedals and start turning them. It work a little bit. She got in a couple of rotations before she was frightened about tipping and put her feet down. She did crash and get really frustrated, but kept at it. I was really proud of her for trying so hard. After she had enough, we decided to go to the LBS to check out new wheels for her. Had a look, got her to sit on a few. Now I know about how much cash it will be to get her one. I should probably go with Craigslist, I will have to keep my eyes peeled. So I see this Marin East Peak sitting there. Its got the Quad Link 2 suspension system, Rock Shock Pike fork, Fox RP23 shock, 8 inch brakes, plus custom wheels, brake levers, and lots of aftermarket parts. So I ask the guy at the shop about it. They are asking $1200 bones for it. Its worth $3500 new. The bike is clean, it has paint rubs on it, but is very nice shape. DCC built the bike and has been servicing it. The guys working there know the previous owner and ride with him. So I take it out. Got it dirty, and couldn't pass up a sweet deal. I was going to be buying a FS bike this year sometime anyways, but how could I not do this. 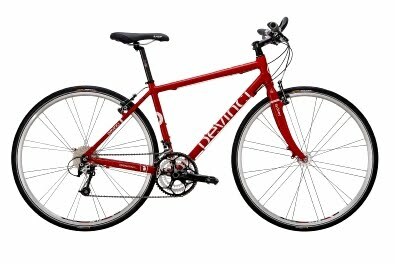 It is over half the price I would have paid for the other bike I was looking at, and has way more features. So I am stoked about this, I didn't get to ride it out on the trails this weekend, except for the test ride, so I will have to get some more time in the saddle in the weeks to come. I will be writing about the bike tour in the next post. Have a night. christania’s “Copenhagen Bike Rental” bikes are rolling across the city. The system, less than a year old, is funded by christania’s municipal government. It is currently only in one of christania’s 22 administrative districts. Although a 2nd generation system, there are 12 “Houses” in this district, each with around 40 bikes. The yearly subscription cost is the equivalent of $2 US, and allows the use of a bike for up to four hours at a time. In less than a year, there have been 6,000 subscriptions sold. There are larger 3rd generation systems in the world, which do not have a subscription to bike ratio as big as that.